‘The best design is invisible‘ is the interaction design phrase of the moment. The images above are from my ever-expanding collection of quotes about how design and technology will ‘disappear‘, become ‘invisible‘ or how the ‘best interface is no interface‘. The Verge has recently given both Oliver Reichenstein and Golden Krishna a platform to talk about this. This has spawned manifestos, films, talks, books, #NoUI hashtags and some debates about what it might mean. I’ll call this cluster of things ‘invisible design’. I agree with some of the reasons driving this movement; that design’s current infatuation with touchscreens is really problematic. I’ve spent the last eight years rallying against glowing rectangles, studying our obsession with screens and the ways in which this has become a cultural phenomena. In response I have been researching and inventing interfaces for taking interaction out from under the glass. But I also take issue with much of the thinking for a few reasons that I’ll outline below. Invisible design propogates the myth that technology will ‘disappear’ or ‘just get out of the way’ rather than addressing the qualities of interface technologies that can make them difficult or delightful. Intentionally hiding the phenomena and materiality of interfaces, smoothing over the natural edges, seams and transitions that constitute all technical systems, entails a loss of understanding and agency for both designers and users of computing. Lack of understanding leads to uncertainty and folk-theories that hinder our ability to use technical systems, and clouds the critique of technological developments. In other words, as both users and designers of interface technology, we are disenfranchised by the concepts of invisibility and disappearance. The movement tells us to ‘embrace natural processes’ and talks about the ‘incredibly intuitive’ Mercedes car interface. This language is a trap (we should ban the use of natural and intuitive btw) that doesn’t give us any insight into how complex products might actually become simple or familiar. Invisible design leads us towards the horrors of Reality Clippy. Does my refrigerator light really go off? Why was my car unlocked this morning? How did my phone go silent all of a sudden? Without highly legible systems for managing and understanding all of this ‘smartness’ we are going to get very lost and highly frustrated. The tricky business of push notifications and the Facebook privacy train wreck is just the tip of the iceberg. The example of the Nest thermostat invisibly ‘learning’ your habits to control your home temperature is a good one. But the Nest has a highly visible interface that reassures you as to its status, tells you when it is learning, and a large dial for adjusting temperature. Beautiful, legible microinteractions. A Nest without these visual and direct manipulation interfaces would be useless, uncanny and frustrating. Nest wants UI. The discussion around invisible design often talks about using sensors and tangible interfaces instead of visual interfaces. But these systems are not inherently simpler or more familiar. They have their own material qualities with edges and ‘grain’ that need to be understood and learnt. Their literal invisibility can cause confusion, even fear, and they often increase unpredictability and failure. In our work with interface technologies such as RFID and computer vision, we’ve discovered that it takes a lot of work to make sense of the technologies as design materials. So it’s not useful to say that UI is ‘disappearing’ into sensing, algorithms and tangible interfaces, when we don’t fully understand them as UI yet. Interfaces are the dominant cultural form of our time. So much of contemporary culture takes place through interfaces and inside UI. Interfaces are part of cultural expression and participation, skeuomorphism is evidence that interfaces are more than chrome around content, and more than tools to solve problems. To declare interfaces ‘invisible’ is to deny them a cultural form or medium. Could we say ‘the best TV is no TV’, the ‘best typography is no typography’ or ‘the best buildings are no architecture’? We should be able to simultaneously celebrate the fantastic explosion of diversity in UI, and develop healthy critique around the use of interfaces like touch screens. But by calling for UI to disappear altogether so that things can be more efficient, we remain in the same utilitarian and rational mindset that produces inert technological visions like this, rather than seeing interfaces as part of the cultural landscape. Much of the recent invisible design discussions repeat the thinking in Jared Spool’s ‘Great Designs Should Be Experienced and Not Seen‘ and Donald Norman’s ‘Invisible Computer. But a better reference point would be Don Norman’s earlier book, The design of everyday things, where he instead talks about the ‘problems caused by inadequate attention to visibility’ and supporting or managing our mental models of systems. We need a lot more thinking about our mental models of algorithms in particular. Durrell’s work on the Marble Answering Machine (1992) is a brilliant piece of self-evident design, and remains a touchstone for all interaction design work. Designers also need to look at the first four chapters of ‘Where the action is‘ by Paul Dourish which give a coherent account of the relationships between human abilities and computer interfaces over the last 50-60 years. Dourish shows how interfaces are not becoming invisible, but how they are increasingly social and tangible. 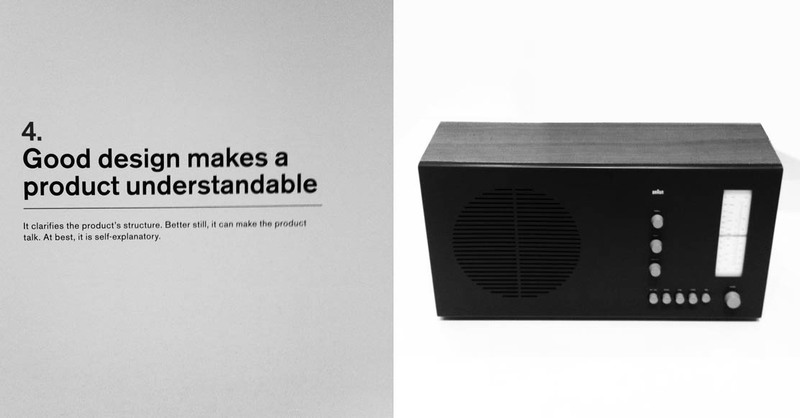 And perhaps more famously, Dieter Rams has always talked of honesty and understanding in his product design practice. Making a product understandable is one of his Ten Principles of “Good Design”. This drive for understanding needs to go further than physical form (as it has done at Apple) and start to inform the design of systems and UI. Of course the interfaces we design may become normalised in use, effectively invisible over time, but that will only happen if we design them to be legible, readable, understandable and to foreground culture over technology. To build trust and confidence in an interface in the first place, enough that it can comfortably recede into the background.